Author(s): Bahman Yousefi, Nosratollah Zarghami, Nasser Samadi, Maryam Majidinia. Department of Biochemistry, Faculty of Medicine, Urmia University of Medical Sciences, Urmia, Iran. Development of resistance in cancer cells results in a high failure rate in cancer chemotherapy in the clinic. Therefore, investigating the mechanisms by which cancer cells acquire the capability to avoid cell death upon exposure to antineoplastic agents is of great significance in cancer research. 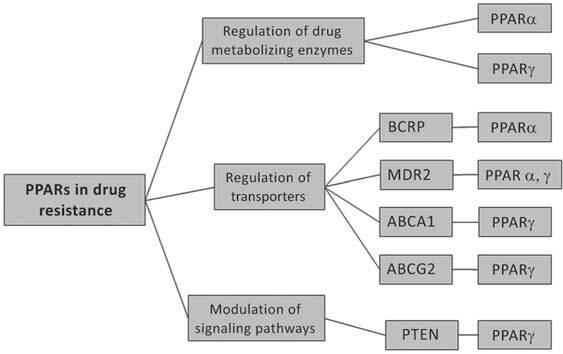 In this review article, we will provide an overview of the mechanisms and molecular machinery of drug resistance in cancer cells which include but may not be limited to altered membrane transport and drug metabolizing enzymes, genetic response, enhanced DNA repair and alternation in the target molecules. A special focus will be on describing the strategies and the rationale for exploitation of peroxisome proliferator-activated receptors for overcoming the observed resistance in cancer cells. Keywords: Cancer, chemotherapy, drug resistance, PPARs, P-glycoprotein, thiazolidinedione. Affiliation:Department of Biochemistry, Faculty of Medicine, Urmia University of Medical Sciences, Urmia, Iran. Keywords:Cancer, chemotherapy, drug resistance, PPARs, P-glycoprotein, thiazolidinedione. Abstract:Development of resistance in cancer cells results in a high failure rate in cancer chemotherapy in the clinic. Therefore, investigating the mechanisms by which cancer cells acquire the capability to avoid cell death upon exposure to antineoplastic agents is of great significance in cancer research. In this review article, we will provide an overview of the mechanisms and molecular machinery of drug resistance in cancer cells which include but may not be limited to altered membrane transport and drug metabolizing enzymes, genetic response, enhanced DNA repair and alternation in the target molecules. A special focus will be on describing the strategies and the rationale for exploitation of peroxisome proliferator-activated receptors for overcoming the observed resistance in cancer cells.